I bought a sago palm for indoors and a glazed clay pot with one drain hole, do I need to put some rocks in the bottom for drainage so I don't wind up with root rot or will the drain hole enough? 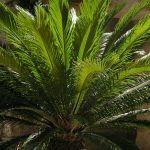 A Sago Palm does not need transplanting or repotting in most cases more then every 1 to 2 years. Your planter with 1 drainage hole is just fine, just make sure the excess water is draining from the soil.